Kessler Interview Puts Spotlight On How To Cover Racist Viewpoints : NPR Public Editor Critics argued that NPR should not give white supremacists a "platform." 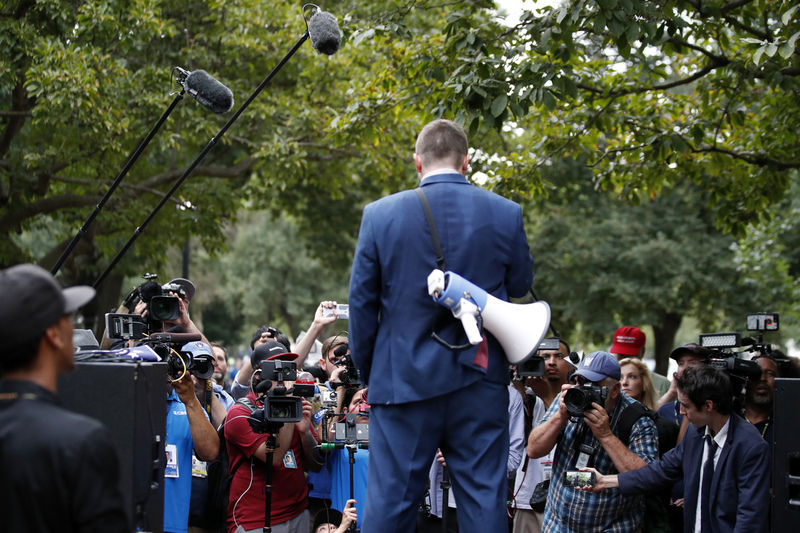 Jason Kessler speaks at an August 12, 2018 rally near the White House on the one year anniversary of the Charlottesville "Unite the Right" march. Sunday's "Unite the Right 2" rally across from the White House was a bust, when just a couple of dozen protesters turned up. But the outrage against NPR over its coverage leading up to the event will likely live for a long time. On Friday, Morning Edition broadcast a nearly seven-minute interview with Jason Kessler. He organized the rally and its predecessor a year ago in Charlottesville, Va., when a white supremacist drove a car through a crowd of counterprotesters, killing one, Heather Heyer, and injuring dozens. Friday's interview, conducted by Noel King, provoked immediate outrage from those who objected to (summarizing broadly here) what they said was NPR giving a "platform" for Kessler to promote his racist agenda. The NPR newsroom itself was divided. Lost in the criticism (here's a Washington Post opinion piece, a ThinkProgress piece and The New York Times report on the outcry) were the many people who said the interview was revelatory. Racism and anti-Semitism are repugnant and harmful beliefs that are gaining currency in this country's increasingly polarized environment. So how should a news organization that reaches a wide swath of the American public treat those who promulgate these thoughts? There is a stark divide in views here. Those who have complained say NPR should not have interviewed Kessler, period, because his views are offensive and it gives oxygen to his cause. Others argue that it's important — at times and with the right context — to hear someone in their own offensive words, and that most people who hear those words will recognize hate speech for what it is. Terence Samuel, an NPR deputy managing editor, told The Times: "I think it's important for us to cover race and racism, and quite frankly, if you're going to do that, you have to talk to racists," he said. Contrast that to the Charlottesville coalition of anti-racism groups who say they will refuse to grant interviews to any news outlet that interviews white supremacists. For a similar point/counterpoint of views see these opinions on covering right-wing extremism posted by Columbia Journalism Review. No one would disagree with Samuel that racism must be covered. The question is how. NPR has been down this path before. Almost exactly two years ago, Morning Edition aired excerpts of an interview with former Ku Klux Klan leader David Duke; in November 2016 it aired an interview with white nationalist Richard Spencer. The complaints were similar. In the nearly two years since, this country has seen a rise in overt racist sentiment; the first Charlottesville march was one manifestation. NPR, in my estimation, was caught flat-footed by the violence in Charlottesville. This time around, the newsroom was clearly determined to pay attention, with an extensive plan for covering the anniversary and the context for Sunday's D.C. rally. Some of those who were upset missed that NPR did not just drop the Kessler interview into Friday's program with no context. It was one element in about a dozen stories across all NPR shows leading up to the weekend. Voices of those harmed by the events of Charlottesville and those wrestling with the aftermath were allotted far more time than Kessler. Among other stories last week on Morning Edition were two pieces focused on Heyer (a moving feature about her mother Susan Bro and a StoryCorps remembrance by Bro, and Heyer's colleague) and an interview with Charlottesville's recently elected mayor, the first black woman to hold the post. The week started with an interview with Vegas Tenold, a journalist who spent several years embedded with white nationalist groups. I asked Kenya Young, the acting executive producer of Morning Edition, how the interview came about. In putting together the week-long narrative, she said, "My biggest goal was finding the characters to this story," and Kessler was where it started. There was debate in the NPR newsroom over whether Kessler was the right person to interview, Young said; "He's actually not that central to this movement anymore." But he also organized the rallies, she said, so in other ways, "He's central front and back." When Charlottesville happened, Young said, "it came out of the blue" for many. Speaking on Friday, before the weekend events, she said: "We are now in a space where, it is planned, it is happening." NPR listeners, she said, "are going to see these people on Sunday and I felt like it was our duty to put a voice to what they were seeing." Young said the purpose of the interview was "was allowing people to hear what the leader of these kind of groups thinks and believes." In that, it accomplished its goal. Kessler talked about white grievance and spouted discredited theories on racial IQs. On Friday, an NPR tweet (quoting verbatim from the story it linked to) said in part: "One year ago, a car rammed into counter-protesters during a violent white nationalist rally in Charlottesville. Activist Heather Heyer was killed." Many rightly called out NPR for the passive voice, seemingly blaming the violence on the car rather than the driver. A much better phrasing would have been the way the Kessler interview was introduced: "A white supremacist drove a car through a crowd of counterprotesters..." It's simple, direct and accurate. Of course, for those who follow these groups closely, those views are not new. Baltimore activist DeRay Mckesson was one of those highly critical of the interview. He tweeted: "Jason Kessler being given an interview on NPR as if white supremacy is a legitimate policy position is a reminder that many of the (white) people making decisions in the media don't feel impacted by any of this — it's either entertainment or 'news' until it hits their doorstep." King responded to similar complaints via a tweet of her own. "I'm a biracial woman. Our Executive Producer is a Black woman. I understand you didn't like this interview; I understand why, but Morning Edition is a notably diverse team who thought long and hard before airing this." But it's legitimate to question who the interview was for, since many people of color, in particular, are quite familiar with the racism manifested in these views. I asked Young to respond. "Part of the listeners, I would say a slim part of our listeners" are familiar with these views, she said. In 2016, "a lot of people ended up being shocked with hearing some of the things that they were hearing and didn't think that some of these thoughts existed." Likewise, she said, with Charlottesville. "And I think that there's still a large swath of people who believe that leaders of organizations, people of Jason Kessler's ilk, still roll around in hoods and sheets. And they do not. They are in our neighborhoods, they are in our schools, he's a [University of Virginia] graduate. I think that the perception of who believes what he believes, for our typical listener, is probably very skewed." Unlike those who are unhappy, I don't see an interview where a journalist pushes back as an automatic "platform." It is not an unmediated Facebook page or a livestream of the rally. This was a straight-out interview, done Tuesday — days in advance of its airing — so NPR had time to consider how to handle it. It consisted of heavily edited excerpts from what was originally nearly an hour-long conversation. And there was no suggestion that this was simply another, alternative, legitimate point of view: King introduced what Kessler was going to say with a disclosure that it would be "racist and offensive." I don't think a one-on-one interview was necessary. But I also don't automatically reject NPR's decision to do so. Sarah Gilbert, NPR's acting vice president for news programming, told me: "Sometimes, selecting clips from an interview and then writing through with copy is a helpful technique when an interviewee has a particularly complex message that requires explanatory commentary throughout. Mr. Kessler's message was quite clear." When introducing a July 29 interview with a scholar who studies extreme right groups, guest host Renee Montagne said: "And then a car rammed into a crowd of left-wing activists, killing one, Heather Heyer." Several listeners, including a Charlottesville resident, challenged the characterization of the counterprotesters as "left-wing activists," noting that many who were there would not self-identify as anything but citizens opposing bigotry and hate. Montagne told me, "This is my fault. I wanted to streamline the language and clearly picked the wrong one of the two possible descriptions of the peaceful, anti-racist counterprotesters," she said. (The introduction originally called Heyer a "left-wing activist" and others in the march "counterprotesters.") I understand why the listeners who wrote objected. NPR should correct the story. Young said essentially the same: In debating whether to simply use clips, "I thought we were being too apologetic for having him on the air, because we were trying to explain his thoughts for him. So then we said, you know what, let's just hear him." Accepting that NPR decided to go the route of playing interview excerpts, I have concerns about the execution. The interview was decidedly set in the context of Heyer's death — it was the third sentence in King's introduction. I've received many complaints that King didn't ask Kessler about Heyer's death. She did. But the newsroom did not air that portion of the interview. I thought that was the wrong choice. Young told me the team hoped "that we would get to a space of what his reflection was of last year." Instead, she said, he simply blamed the police and the anti-right movement known as Antifa. "He did it over and over again. " She cited one exchange where Kessler essentially contrasted Heyer's life and the group's civil liberties. "I was not going to air that about Heather Heyer," she said. Fair enough. But NPR should have found a way to say that the question had been asked and summarize the answer. I also would not have aired in such detail Kessler's views on racial differences. True, it served to illuminate his beliefs. King's pushback was not to cite statistics (as critics wanted), but a shorthand scoff at Kessler's citing of controversial scholar Charles Murray: "Charles Murray? Really?" That set up a dynamic where she was arguing with him, instead of citing the facts. Young said, "We went back and forth as to whether to put her pushback in. There was no way that someone could mention Charles Murray and not have pushback. It's just not possible." NPR decided to include context about Murray's "debunked" theories in advance of that section, but as a result many listeners simply didn't grasp the full meaning of the exchange. That part of the interview came closest to being a platform, for those not familiar with the debate dating to the 1994 publication of Murray's co-authored book, The Bell Curve: Intelligence and Class Structure in American Life. Overall, the one-hour interview was strong but listeners did not hear it. If NPR had published the full transcript, I think some criticisms would have been answered or avoided, but it would also have been a far greater platform for Kessler, for those who consider it such. Finally, other elements were missing for me, including the kind of biographical context provided in a deeply reported weekend Washington Post profile of Kessler. That's another criticism I have made in the past of NPR; interviews are too often dropped in with not enough set-up as to the background of the speaker. I continue to wish to see more and better labeling of just who is speaking and in what context. Another criticism was NPR's decision to follow Kessler with a shorter interview with Hawk Newsome, president of Black Lives Matter of Greater New York. That pairing, the critics felt, set up a false equivalence. The newsroom paired it that way because Newsome, as King explained, had been invited to speak at Kessler's rally. "We thought it actually made most sense to go to the person that he invited and who made the decision to decline, but was coming anyway to counterprotest," Young said. Moreover, she did not want Kessler's interview to stand alone. Better in that case would have been to pair Kessler with, say, something similar to the Tenold interview on the rise of white nationalists from earlier in the week, when he predicted that Sunday's "Unite the Right 2" would fizzle due to infighting among far-right groups. That would have added the context to Kessler that listeners felt was missing, and avoided the perception that there even is a rational counterbalance to Kessler's views. I'm told those in the newsroom involved in the decisions around the interview took in the debate throughout the weekend, considering thoughtfully the criticisms. Gilbert told me Monday, "The Morning Edition team made the right decision to interview Kessler. They consulted widely and took on board plenty of advice before making the call. We all knew that we would come in for some criticism, and nobody wants to upset listeners, but they and I felt that turning away from this rhetoric was not the way to understand it and its implications." My conclusion: the interview was painful to hear; it had me yelling at the radio, as I know many others did. NPR's audience is vast; it is still overwhelmingly white. Part of how one heard it may depend on how closely one has followed this story and whether one experiences that type of prejudice. There is no right answer here for everyone. I do think Kessler's racism and general illogic came through, even in the absence of the more aggressive pushback some critics wanted, and NPR listeners are smart enough to hear that. NPR has decided it will air these interviews. I am on the fence about whether they are necessary. But if NPR is going to go that route, it needs to strengthen its practices for a more responsible execution. A reminder: The NPR Ombudsman/Public Editor serves as an independent critic of NPR's reporting. We make the newsroom aware of listener concerns and help listeners understand why the newsroom makes the decisions it does. In investigating concerns we often suggest changes, but the Ombudsman has no management authority; we don't speak for the newsroom or for NPR—just for ourselves—and the newsroom can take our suggestions (or not). Annie Johnson and Jeanine Santucci contributed to this post.